STEP 1 Get detailed information about the conditions and the environment when the incident occurred. WHAT Vehicle Model, Engine, Transmission/Transaxle and the System (i.e. Radio). WHEN Date, Time of Day, Weather Conditions, Frequency. HOW System Symptoms, Operating Conditions (Other Components Interaction). Service History and if any After Market Accessories have been installed. STEP 2 Operate the system, road test if necessary. Verify the parameter of the incident. If the problem cannot be duplicated, refer to “Incident Simulation Tests”. Identify where to begin diagnosis based upon your knowledge of the system operation and the customer comments. STEP 4 Inspect the system for mechanical binding, loose connectors or wiring damage. Determine which circuits and components are involved and diagnose using the Power Supply Routing and Harness Layouts. STEP 5 Repair or replace the incident circuit or component. STEP 6 Operate the system in all modes. Verify the system works properly under all conditions. Make sure you have not inadvertently created a new incident during your diagnosis or repair steps. Never reverse polarity of battery terminals. Install only parts specified for a vehicle. Before replacing the control unit, check the input and output and functions of the component parts. Do not apply excessive force when disconnecting a connector. 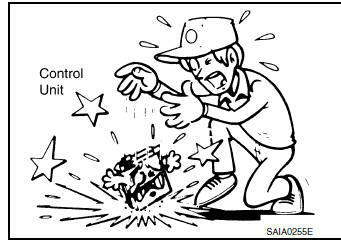 Do not apply excessive shock to the control unit by dropping or hitting it. Be careful to prevent condensation in the control unit due to rapid temperature changes and do not let water or rain get on it. If water is found in the control unit, dry it fully and then install it in the vehicle. Be careful not to let oil to get on the control unit connector. Avoid cleaning the control unit with volatile oil. Do not disassemble the control unit, and do not remove the upper and lower covers. When using a DMM, be careful not to let test probes get close to each other to prevent the power transistor in the control unit from damaging battery voltage because of short circuiting. When checking input and output signals of the control unit, use the specified check adapter.